AOPA has overhauled its website, and I’m busy updating the links to aviation resources at AOPA and the Air Safety Institute on the pages for my books about flight simulations (Microsoft Flight Simulator as a Training Aid and Scenario-Based Training with X-Plane and Microsoft Flight Simulator). You will also find links to many posts here at blog, and I’m working to update those references, too. The other day at BeechTalk, a forum for owners and operators of Beechcraft (Bonanzas, Barons, and the like) a long, surprisingly contentious, thread started with a simple question: When can I cancel IFR? The pilot who posed the question described a common situation. An IFR aircraft is approaching an airport that does not have an operating control tower. Other airplanes are en route to the same airport or are waiting on the ground for a release to depart. When the current weather is IMC, ATC can allow only one aircraft at any time to operate under IFR (or special VFR) within the (usually) Class E airspace surrounding the airport. Until an approaching aircraft cancels IFR, either in the air or after landing, no other aircraft can fly an approach or depart under an IFR clearance. FAA is now publishing telephone numbers that pilots can use to cancel IFR and obtain an IFR release at non-towered airports. The numbers are listed in the Chart Supplement (A/FD) listings for many airports. More information about this topic is available here at BruceAir. 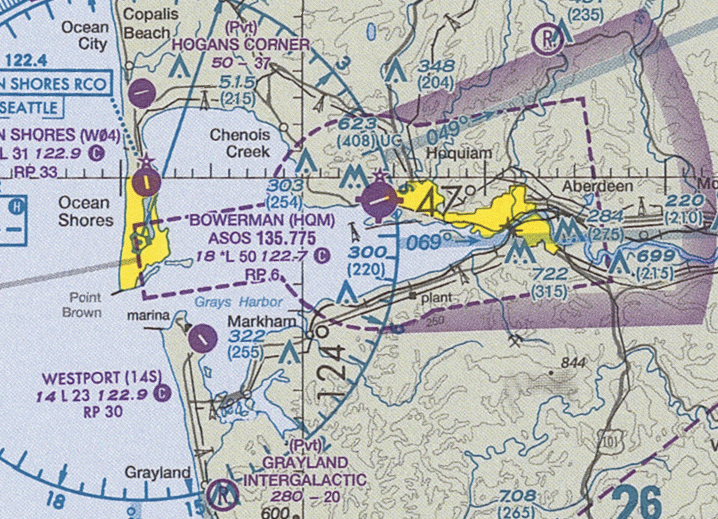 Bowerman Airport (KHQM) on the southwest Washington coast is an example of such an airport. 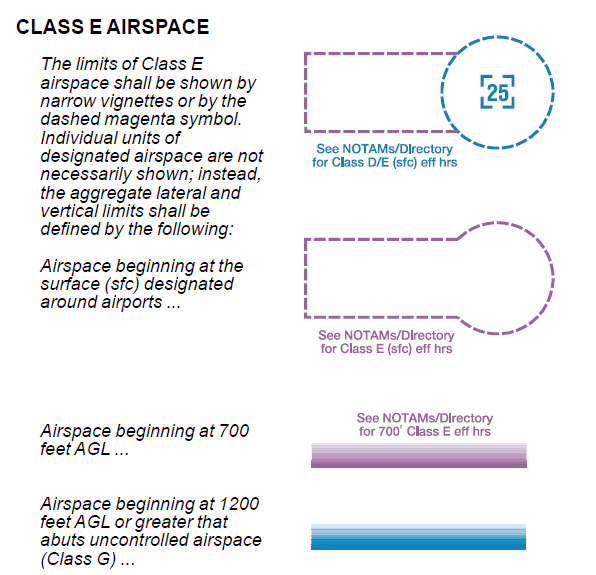 It does not have a control tower, and, as indicated by the dashed magenta lines, it is enclosed by surface-based Class E airspace (as opposed to Class E airspace that begins at 700 ft. AGL). The surfaced-based Class E airspace extends west and east of the airport to protect the final approach paths for the instrument approaches that serve KHQM. Suppose you are approaching KHQM on an IFR clearance. You fly one of published procedures and at some point during the descent, you break into the clear below the clouds. When ATC cleared you for the approach, the controller directed you to report canceling your IFR flight plan either on an ATC frequency or through flight service (in this case, Seattle Radio). You know (or suspect) that other aircraft are waiting to follow you or to depart KHQM, so you are eager to cancel IFR as soon as possible to free up the airspace. It’s often much easier and faster to cancel IFR directly with the controller you’ve been talking to than to use a ground communication outlet or to relay a cancelation through flight service via radio or a cell phone call. But when can you legally cancel IFR? The basic answer is in AIM 5−1−15. Canceling IFR Flight Plan. The key to that statement is “operating in VFR conditions.” And that stipulation depends on both the weather and the type of airspace you’re operating in. (c) Except as provided in § 91.157, no person may operate an aircraft beneath the ceiling under VFR within the lateral boundaries of controlled airspace designated to the surface for an airport when the ceiling is less than 1,000 feet. (2) If ground visibility is not reported at that airport, unless flight visibility during landing or takeoff, or while operating in the traffic pattern is at least 3 statute miles. In marginal VFR conditions, a few wispy clouds often lurk around the airport. To meet the letter of the law, you must make sure that you can clear all of them by at least 2,000 ft. horizontally and 500 ft. vertically. It’s important to keep this discussion in perspective. When the weather is marginal and you’re flying an approach, canceling as soon as you break out (even if were legal given current conditions) saves only a couple of minutes versus canceling after landing and clearing the runway. Flying another lap around a holding pattern, slowing down, accepting a delay vector, or idling at the hold-short line at the runway for a few minutes while you wait for a release is occasionally part of flying IFR. Canceling on the ground can be more cumbersome than speaking directly to the controller who cleared you. But even if the airport doesn’t have good radio coverage on the ground and you have to call flight service on the phone, it’s usually not a big deal. We all have cell phones. Many of us can connect our phones to our headsets or audio panels via Blutetooth. (If you have to call FSS, call the IFR clearance number [888-766-8267] or the main FSS number [800-992-7433] and say “Briefer” as soon as you’re connected so that you can skip the prompts and give the specialist your N-number, location, and intention to cancel IFR.) You can also relay your IFR cancelation through another aircraft that is high enough to communicate directly with ATC. We all like to help ATC and our fellow pilots by clearing the airspace for the next airplane on approach or to assist the pilot waiting for a release to depart. But trying to sort out the legality of canceling in the air during a critical phase of flight just isn’t worth the risk of distraction or violating the FARs, especially when the delay is so short. If you don’t break out in obvious VMC with plenty of time to juggle canceling, monitoring the CTAF, and keeping an eye out for traffic, land the plane and cancel when you’re safely clear of the runway. The FAA has updated its Air Traffic Control handbook (JO 7110.65) with changes to approach clearances issued by controllers. The new procedures and phraseology, which primarily affect RNAV-equipped aircraft, were published in this notice (PDF), are effective June 3, 2013. This change provides guidance when a controller does not require an aircraft to fly the hold-in-lieu-of procedure turn but requires the aircraft to fly the straight-in approach. Vectoring to a fix along the final approach course prior to the final approach fix (FAF) is permitted. Appropriately -equipped area navigation (RNAV) aircraft may be cleared to the intermediate fix (IF) on conventional and RNAV instrument approach procedures when the IF is identified with an “IF” on the instrument approach procedure. Procedures and graphics are provided for an aircraft on unpublished routes cleared direct to a fix between the IF and FAF. Guidance is provided for when an aircraft will fly a radius to fix (RF) leg, published on an RNAV approach. The first item should eliminate confusion among many pilots when a approach chart shows a holding pattern in lieu of a procedure turn. Controllers will now explicitly clear aircraft “straight-in” when they don’t want the pilot to fly the holding pattern. The second item will reduce radio chatter and make it easier for RNAV-equipped aircraft to fly efficient approaches. Pilots may want to review how they load approaches into GPS navigators to avoid what I call the vectors-to-final scramble. The last item in the summary refers to RF legs, which at present are part of authorization-required RNP approaches that aren’t available to typical GA pilots. I’ve posted several new videos on my YouTube channel. I shot these videos during practice flights last week before the Extra 300L went in for its annual inspection. As soon as it emerges from the shop and the weather cooperates, I’ll fly it north to Seattle for the summer. As the descriptions note, these videos show typical aerobatic practice sessions, sequences of maneuvers designed to sharpen my skills and build G-tolerance the summer flying season approaches. Keen observers will note many flaws, but that’s why we practice. You may also notice how important it is to look around–not just stare straight ahead–during most maneuvers. Checking the wingtips, looking back toward the tail, etc. all help you maintain orientation during maneuvers and fly more precisely. Learning where to look when is a key part of aerobatic training. In some videos, I adjusted the GoPro on my head to show a bit more of the instrument panel, although as I often explain, except for a couple of checks of the gauges at the beginning of and between maneuvers, flying aerobatics well depends on keeping your eyes outside the cockpit. Here’s one video to get you started.